From the foregoing, it will be appreciated that the present invention provides a means and method for decoupling a plug of a power cord from an electrical outlet by applying a force with fingers, rather than entire fists, at a distance from theplug. Moreover, the decoupler and method are convenient, safe, easy to use, reduce the exposure of users to electrical shock and/or damage to wires, plugs and outlets. This invention relates to electrical power cord and more particularly to a decoupler and method for decoupling a plug of a power cord from an electrical outlet, by way of example, in a home or office. When decoupling a plug from an electricaloutlet, it is a common practice to grasp and exert a pulling force on the wire attached to the plug with the entire fist rather than the plug. Manufacturers have addressed this problem by strengthening the attachments of wires to plugs of power cords. However, this has provided only partial relief and further improvements would be provided with a decoupler which was particularlyadapted for grasping the wire with a user's fingers, at a distance from the plug. Such a device would recognize the practice of many users, i.e. of grasping the wire rather than the plug, and consequently reduce their exposure to electrical shock and/orreduce damage to power cords, plugs and outlets. In addition to its convenience, the invention will find favor with persons who are reluctant to grasp power cord plugs, reduce their exposure to electrical shock and/or reduce damage to cords, plugs andoutlets. These benefits are derived by exerting decoupling forces to wires of power cords with fingers rather than entire fists at distances from power cord plugs. The collar or flange may be formed integrally with the cord at a fixed distance from the plug or be selectively adjustable to apply decoupling forceswith fingers rather than entire fists at distances from power cord plugs. 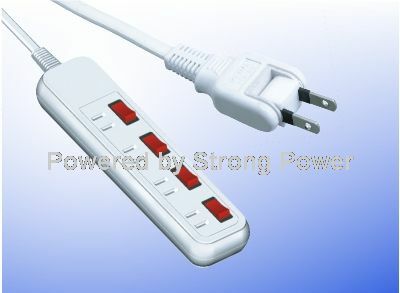 One feature of the invention is that it is readily adaptable to existing power cords. 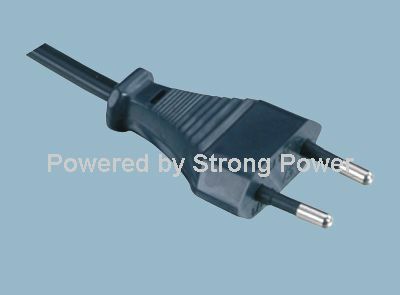 Moreover, it may be molded in place or adhesively bonded to a power cord 20 by a manufacturer as shown in FIG. 1, or mechanically attached as shown in FIGS. 3,10 and 14. When the invention is to be used under a variety of conditions, multiple collars 32 may be provided at intervals along the wire 33 of the power cord 34 as shown in FIGS. 6 and 7. The arrangement of circular collars 32 provides a user with theoption of selectively grasping a collar 32 at varying locations to decouple plugs from outlets. The decoupler 35, preferably made of a resilient material, has a body37 which is divided lengthwise by a gap 38, a tapered portion 39 and an adjoining shoulder portion 40. Extending axially through the body 37 is an aperture 41 for receiving the wire 42 of the power cord 36. At one end of the aperture 41 is an inwardlyextending pointed projection 45. From the foregoing, it will be appreciated that the present invention provides a means and method for decoupling a plug of a power cord from an electrical outlet by applying a force with fingers, rather than entire fists, at a distance from theplug. Moreover, the decoupler and method are convenient, safe, easy to use, reduce the exposure of users to electrical shock and/or damage to wires, plugs and outlets.